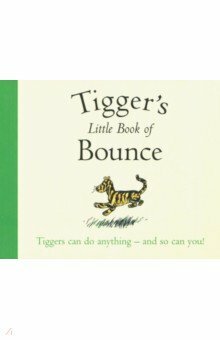 Winnie-the-Pooh: Tigger's Little Book of Bounce Egmont Books "Can Tiggers swim?" "Of course they can. Tiggers can do everything." In Tigger's Little Book of Bounce, we're reminded of just what we cherish about the most energetic animal in the Hundred Acre Wood. A little book bursting with Bouncy Bon Mots about Things Tiggers Like. It's The guide to Get-Up-and-Go! The perfect mini-series to accompany A. A. Milne's classic children's stories about Winnie-the-Pooh, Tigger, Piglet, Eeyore and friends. Each of these little books offer a unique take on life straight from the mouths of Milne's famous characters. Аннотация к книге "Winnie-the-Pooh: Tigger's Little Book of Bounce"
"Can Tiggers swim?" "Of course they can. Tiggers can do everything." In Tigger's Little Book of Bounce, we're reminded of just what we cherish about the most energetic animal in the Hundred Acre Wood. A little book bursting with Bouncy Bon Mots about Things Tiggers Like. It's The guide to Get-Up-and-Go! The perfect mini-series to accompany A. A. Milne's classic children's stories about Winnie-the-Pooh, Tigger, Piglet, Eeyore and friends. Each of these little books offer a unique take on life straight from the mouths of Milne's famous characters. Издательство: Egmont Books, 2018 г. –20 % Выгода 140 ₽ Winnie-the-Pooh 3 рец. –20 % Выгода 140 ₽ Winnie-the-Pooh. Now We Are Six 1 рец. –20 % Выгода 140 ₽ Winnie-the-Pooh. The House at Pooh Corner 1 рец. Если вы обнаружили ошибку в описании книги "Winnie-the-Pooh: Tigger's Little Book of Bounce" (автор Milne A. A. ), пишите об этом в сообщении об ошибке. Спасибо!